If you are planning to stop here for a while, you will probably be hard in luck since this bridge is always bustling with traffic and people. Built in 1962, the bridge is a connecting route between the Real Old City and West of Ahmedabad and passes over the Sabarmati River. It is considered to be a fine specimen of engineering with its beautiful structure and derives its name from Jawaharlal Nehru who was the first prime minister of India. Marked as a prominent attraction, the bridge resides near Patong revolving restaurant which also makes it highly accessible for the crowd. Drive through it and relish beautiful vistas overlooking the city. How popular is Nehru Bridge? People normally club together Amdavad Ni Gufa and Lothal while planning their visit to Nehru Bridge. Very nice place for short walk in evening or night. Connecting bridge over Sabarmati river where you can see great view of Sabarmati River. 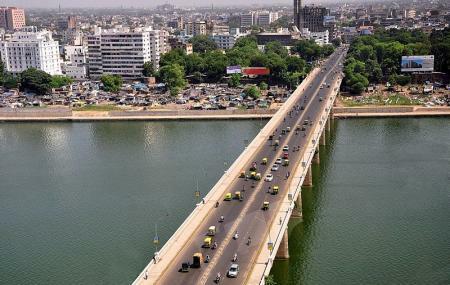 Nehru bridge is a one of prime traffic passing way from old Ahmedabad city to New west Ahmedabad .Both sides of the bridge one of identity location of the beautiful city of Ahmedabad. Patang Hotel SVP hospital Riverfront ,boating side of river River front Office building solar tourch etc. Famous Bridge named after Jawaharlal Nehru. Awesome view point of Sabarmati River, on the other side there is River Front, place you can hangout.